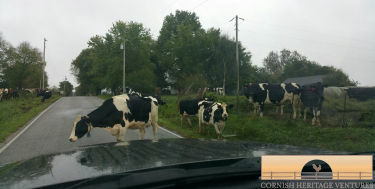 As we neared the farm where we go to pick up our weekly milk today there were another farmer’s herd of milk cows who had escaped. Our milk comes from pampered Jersey cows. It is very evident that they are extremely well cared for. Talk about looking sleek, unlike these naughty girls. Hope your week has been a good one. Richard and I are exhausted as is Daniel but it’s a good tired. Daniel’s been working on the farm this week helping to pull down an old mobile home. It has been a LOT of hard work but they got the job done. Great work experience for him! ABC Photo Art is finally beginning to take off. Business up to now has been a little slow but we have also had a lot to learn and continue to “tweak” it. It still is not where we want it but progress has been made. I love to see folks pick their letters and matboard colors and then start to arrange their collage the way they want it, creating a unique piece of art that no one else will likely ever have. (Sometimes they just give us free reign to create it the way we think best.) Richard has been busy on the ambulance and looking after kids when home and I have been at the Mill. We are blessed to be able to tag-team. Fall weather has finally arrived here in Branson. We had to get out the electric heaters last night for the first time this season.